Abstract: This paper introduces the current research status of magnetic confinement fusion in China. The major contents include developments of Tokamak type magnetic confinement devices and related experimental researches on the plasma physics, research activities on the International Thermonuclear Experimental Reactor (ITER) construction and fundamental studies, design of blanket module and R/D of ITER-TBM, conceptual design and studies on the demonstration reactor of fusion nuclear power plant, and researches on fusion reactor material CLAM (China Low Activation Martensitic steel). 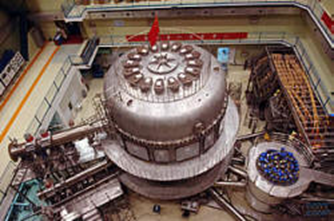 EAST (Experimental Advanced Superconducting Tokamak) is the first fully superconductor Tokamak device in the world which is independently designed and constructed by experts in China (Fig.1). The features of the device and its major technical parameters are as follows: 16 large D type superconducting Toroidal Field (TF) coils are used to generate central magnetic flux density as large as 3.5 T; 12 Poloidal Field (PF) superconducting magnets can produce flux change as large as ΔΦ ≥10 VS, which makes possible a plasma current of million Amperes; Continued plasma current can keep as long as 1000 seconds, and the plasma can reach 100 million degree of temperature by using a large power heating system. The other major profile of the EAST device includes: Height of the structure: 11 m, Diameter of the structure: 8 m, Weight of the structure: 400 tons. The Device consists of 6 major subsystems: Vacuum Vessel, PF magnets, TF magnets, Inner and Outer thermal shielding, Outer Vacuum Dewar and the Supporting System. To support the operation of the system, a large scale cryogenic system for providing liquid Helium, a system of high power pulsed electricity source and circuit, testing system for large superconducting magnets, a large computer system for control, data acquisition and processing, a Mega-Watt class lower hybrid wave current driving and microwave heating system, large super vacuum system, and advanced diagnosis systems etc. Researches on key physical problems related to a stable and advanced Tokamak fusion reactor are carrying out with use of EAST, including: advanced stable plasma operation mode, the confinement and transportation behaviors of plasma, interaction between first wall and plasma under the condition of stable divertor, on-line control of stable plasma and operation safety, new generation techniques for reactor heating and diagnosis. The construction and physical researches can provide experience for the ITER project. EAST is the only device in the next ten years that can provide platform for the advanced long pulse stable operation and non-circular cross-section plasma. It will play a key role for the physical research projects on the development of high quality stable plasma, which can contribute the ITER project and consequently, the development of controllable fusion energy. HL-2A has been finished its construction at the end of 2002 by the SWIP. It is an experimental Takamak device of non-circular cross-section with advanced divertor configuration. The major target of the device is to perform experiments to improve the plasma confinement under condition of high plasma parameters. 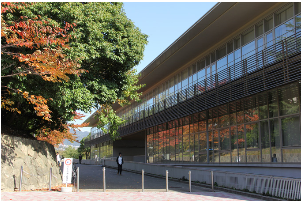 At the same time, by using its special divertor structure, the experimental researches on the frontier physics problems and related engineering issues will be conducted. The major parameters of the HL-2A are those listed in the Table 1. The major experiments on plasma physics performed in HL-2A are as follows: Optimization of magnetic field configuration, Acquisition of variable cross-section plasma with triangle configuration, Divertor physics including control of plasma particle and energy, transportation of boundary plasma, researches on SOL physics and advanced divertor configuration, plasma confinement, studies on physics and methods to establish advanced plasma configuration and to improve the plasma confinement based on plasma parameter control, researches on two step heating and current driving, including heating technique of neutral beam injection, driving current and control of plasma rotation, Ion Cyclotron Resonance Heating (ICRH) and fast wave current driving, Lower Hybrid wave current driving, and their synergetic effects with neutral beam injection and ICR, etc. Now, the upgrade of HL-2A to HL-2M is also considered. Since joined the ITER program in 2003, China institutions are actively involved to the ITER related researches and developments. According to the agreements, the major packages of ITER engineering construction taken charge by China are as follows: TF Conductors (7%), PF Conductors (69%), Feeders (100%), Correction Coils (100%), HV Substation Materials (100%), AC-DC Converter (62%), Transfer Cask System (50%) and Diagnostics (3.3%). The major institutions in charge of the ITER packages are ASIPP and SWIP. 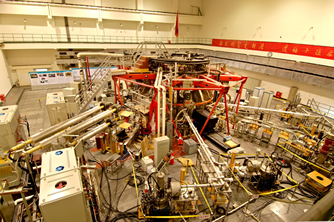 At the same time, China Ministry of Science and Technology has started domestic research projects related to ITER program. The foundation of ITER related domestic research is about the same amount with that of the China investment for ITER construction. The major research topics of domestic researches include: Fusion reaction experimental devices, Superconducting magnets, High power pulse current source, Testing Blanket Modules (TBM), Computer control and data acquisition processing system, Plasma heating techniques, Plasma physics etc. L. Qiu, Fusion Energy and applications, China Science Press, 2008. B. Shi, The principle and practice of magnetic confinement fusion, China Nuclear Energy Press, 1999. Y. Wu et al. Conceptual Design Activities of FDS Series Fusion Power Plants in China. Fusion Engineering and Design, 2006, 81(23-24): 2713-2718. Y. Wu et al., Conceptual Design of fusion driven subcritical reactor, China Journal of Nuclear Science and Engineering, 2004, 24(1), 72-80. Y. Wu et al., Conceptual Design of the Fusion-driven Subcritical System FDS-I. Fusion Engineering and Design, 2006, 81, Part B: 1305-1311. T. Ihli, L. Giancarli, S. Konishi, S. Malang, F. Najmabadi, A.R. Raffray , A. Sagara, Y. Wu., Review of Blanket Designs for Advanced Fusion Reactors. Fusion Engineering and Design. 2008, 83: 912-919. Y. Wu, Design Status and Development Strategy of China Liquid Lithium-Lead Blankets and Related Material Technology, Journal of Nuclear Materials, 2007, 367-370, Part B-2: 1410-1415. Y.Wu, H.Wang, Y.Ke and W.W, Progress in Magnetic confinement fusion reactor and Design of ITER TBM . China Review of Atomic Physics,2006, 23(2): 89-95. Y. Wu and the FDS Team, Conceptual Design and Testing Strategy of a Dual Functional Lithium-Lead Test Blanket Module in ITER and EAST. Nuclear Fusion, 2007, 47(11): 1533-1539. Y.Wu, W.W et al., Strategies Design and Testing of ITER Liquid LiPb TBM in China, Nuclear Science and Technology, 2005, 25(4): 347-360. C.P.C. Wong, J-F. Salavy, N.B. Morley, I. Kirillov, Y.H. Kim, Y.C. Wu, S. Tanaka, R. Kumar, Overview of Liquid Metal TBM Concepts and Programs, Fusion Engineering and Design, 2008, 83: 850-857. Y.W, Q.Huang, Z.Zhu et al., Progress in Design and Development of Liquid LiPb experimental loops in China, Nuclear Science and Engineering, 2009, 29(2): 161-169. C.H. Pan, Y.C. Wu, K.M. Feng, S.L. Liu. DEMO Development Strategy Based on China FPP Program. Fusion Engineering and Design, 2008, 83: 877-882. Y. Wu, and FDS Team, Conceptual Design of the China Fusion Power Plant FDS-II. Fusion Engineering and Design, 2008, 83(10-12): 1683-1689. Y.Wu, W.W and S.Liu, Conceptual Design of Fussion Nuclear Power Plants, Chin a Nuclear Science and Technology,2005, 25(1): 76-85. C.P.C. Wong, V. Chernov, A. Kimura, Y. Katoh, N. Morley, T. Muroga, K.W. Song, Y.C.Wu, M. Zmitko, ITER Test Blanket Module Functional Materials. Journal of Nuclear Materials, 2007, 367-370: 1287-1292. Q.Huang, C.Li and Y.Li, Progress of Researches on the Low Activation Martensitic Steel CLAM in China, China Nuclear Science and Engineering, 2007, 27(1): 41-50.